Thai Yoga Bodywork | Fort Collins, CO - Fort Collins Massage. Thai Bodywork. Yoga. Thai yoga bodywork has worked it's way to this page from the time of Buddha, over 2000 years ago. It has been passed down through families, scarce medical texts, and village shamans. Cool, right? Much like most Eastern healing modalities, it had been slow to make it's way into the western world. We are so lucky to live in a time where these ideas are embraced and taught and made available to us. The goal of TYB is to release blocked energy from strategically located energy lines (known as Sen) throughout your body. Stretching, rhythmic compressions, acupressure, assisted yoga poses, and range-of-motion exercises are just a few of the techniques that will be utilized during a typical session. Energy balancing techniques are also used to encourage healing. You will need to wear comfy, movable clothes. You will remain clothed throughout the session. You will lay on a mat, and unless otherwise instructed, you will relax your body and mind (no helping. it makes it much harder for the practitioner). Your practitioner will move, stretch, and manipulate your body through the session. As with a traditional massage, you have a responsibility to honor your body and communicate with me about the pressure or intensity of the stretches. 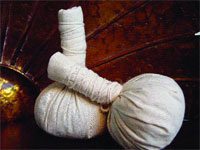 Thai Herbal compresses are made from a variety of herbs (we use a combination of lemongrass, eucalyptus, peppermint, galangal and ginger root, anise and sea salts) which are wrapped up in a light fabric and steamed. The hot and steamy compresses are used throughout the session. The moist heat assists in warming the muscles and the steam releases the aromas from the herbs to create a blissful mind/body retreat. After your massage the compresses are yours to take home to use again and again! A typical session is 1.5- 2 hours.